I have a three year old black and tan boy German Shepard. He is the best dog you could ever have. He is very protective and territorial. He can do the COOLEST trick ever. We have a huge basket in the living room filled with his toys, and when he pulls out his toys and is done playing with them,we say put up your toys Harley, and he goes around picking up his toys and puts them back in his toy basket. Now, I've never met another dog that can do that, have you? He is really silly too. Our kitchen floor is really slippery and when we throw his toys in there for him to fetch he slides when he tries to run. he's hilarious! He also has a wierd marking on his belly, it looks like a heart. Anyway, he's the best dog EVER! And to all our other readers out there on the internet, please leave some feedback about Harley the wonder dogs story - and the others you can read on this site too. We'd love to have you join in with us here and place a video of your own German Shepherd puppy or dog - or tell us your own GSD story in our sharing section. 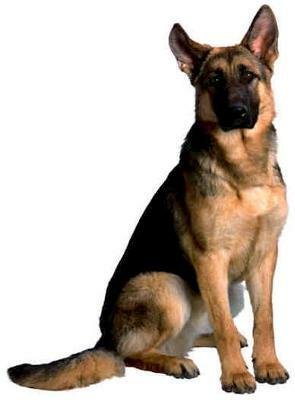 We'd also love to see your German Shepherds pictures - after all the German Shepherd is one of the most beautiful dogs on the planet! I'm sure we can all agree on that and by sharing them we can all enjoy. So now it's all up to you to join in on the sharing. It's pretty easy to do too - just click on the link that says "Click here to post comments". And if you want to read what others have said, or read about other German Shepherd stories you can do that too at the same place. Thanks for visiting us here at Total German Shepherd. He is truly a "Wonder Dog", how did you get him to put back his toys? Amazing! He sounds like a great dog! Take care.